Teaching Blog Round Up: Thank You! Merry almost Christmas! Renee here, from Fantastic First Grade Froggies. I don't know about you but this month is flying by. I think I was stuck in a tailspin all of last week, but vacation has arrived. Well, just as quick as Christmas has arrived it will pass and it will be time to send out thank you notes. I wanted to make up something simple that my kindergarten son could fill out on his own with his kinder spelling. 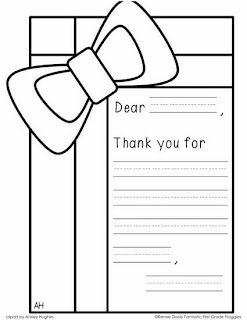 I made up this simple letter template that leaves him room to write what he received and draw a picture on the side. I thought you may enjoy it as well!